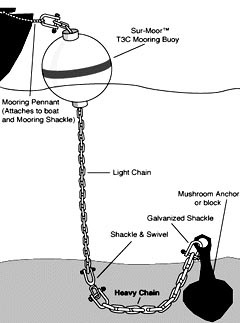 A typical system consists of a mushroom anchor connected with one or two shackles (of the same size as the bottom chain) to a heavy bottom chain which should be about 1.5 times the maximum depth of water. A swivel (if needed) with a shackle on either side will connect the bottom chain to the top chain whose length should be equal the maximum depth of water. The top chain will go through the mooring buoy and a shackle will secure it.A rope pennant will go from this shackle to your boats mooring cleat.A pickup buoy would be tied into the pennant eye splice for easy retrieval when returning to the mooring. Example:In 10 ft.of water you would need 15 ft. of bottom chain and 10 ft. of top chain. See CHAIN for size and weight requirements. This is a typical installation.Check with your local official for requirements before installing.